What about the Phillips references? There are several references to people surnamed PHILLIPS in relation to the DALTON family that should interest the genealogical researcher. Do they offer clues or evidence of a relation between the family of Tom and Bea PHILLIPS and this DALTON family or are they unrelated? With a little research we find that Tom and Bea Elizabeth Phillips' son John was 17 and living in Elmore for the 1900 census. He turned 19 August of 1901 and Nannie died 6 months later. There is no evidence he ever lived in Guthrie and a 19-year-old farm boy could not have paid for this large, expensive tombstone for Nancy Clute. Obviously the name on the stone is not this John Phillips. Tom Phillips also had a brother named John who was born about 1857 in Texas, but he died at 20 years of age in 1878. John W. PHILLIPS born May 1851 in Iowa. His occupation is "marble cutter". He died in 1909 – John W. PHILLIPS, May 17, 1851 - Feb 19, 1909. On the 1903 Guthrie city directory his business is listed as "Capital City Marble and Granite Works, John Phillips Propr, 216 E Harrison. He is not listed on the 1896 directory, so his business was probably founded after that and was no more than a few years old when Nannie died in 1901". John T. PHILLIPS b. July 1844 in Indiana, is single and is a lodger in the Guthrie Hotel. His occupation listed as "real estate". 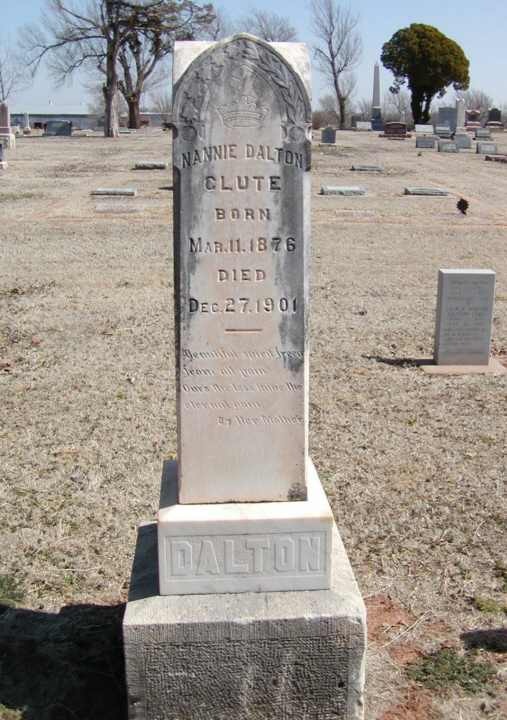 Nannie Dalton Clute's headstone was moved in 1909 from the family farm to Kingfisher Cemetery. John Phillips, marble cutter, could not have engraved Nannie's stone when her body was moved as he died in February of that year. He must have carved it after Nannie died in 1901 and it was moved with her body or perhaps his son Albert carved it using his father's business name. The name in small letters on the reverse side and at the base of Nancy Clute's tombstone is the signature of the stone mason who engraved it – a man from Iowa unrelated to the family of Tom and Bea Phillips. 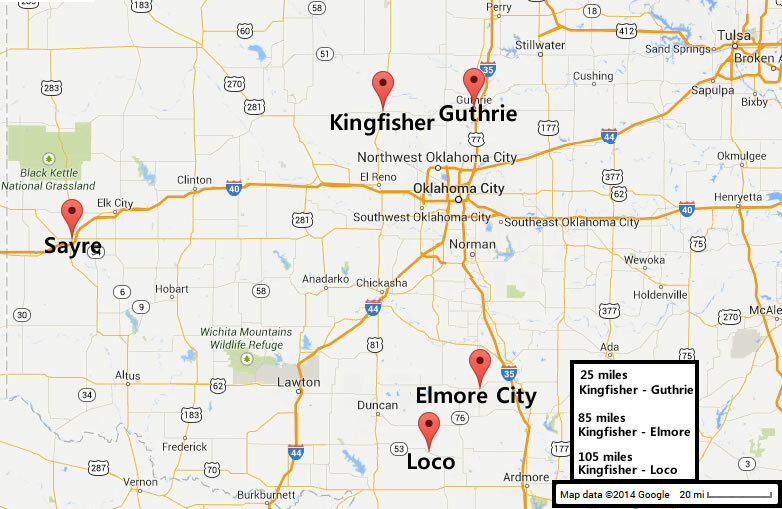 The Dalton family lived in or near Kingfisher. The family of Tom and Bea Phillips lived in Elmore (later renamed to Elmore City). Regarding the pall bearer (below) John Phillips, son of Tom & Bea, was using his middle name "William" at the time and was living in Sayre. John Phillips, pall bearer at Simon Dalton's funeral. Another proof offered for Bea's relation to the Dalton family is that a John Phillips is listed as a pall bearer in Simon Dalton's obituary. This funeral occurred Sept. 14, 1928. This might be a weak clue but it is not a proof since a pall bearer is typically a friend of the deceased and not necessarily a relative. Simon's obituary reads "Pall bearers were chosen from among those who knew him most intimately here during his early life". This does not say "family". The pall bearers were clearly friends of Simon, not relatives. Why are we focused on pall bearer number 3, John Phillips? Quite simply because someone is grasping for proof that their family is related to the Daltons. Using that logic, we should ask if the WICKMILLER, BROWN, SMITH, MEAD or INGRAM family is also related. There is not one shred of evidence found anywhere, other than the distorted creations of Bill Phillips, that the PHILLIPS family is related to the DALTONS. This John Phillips is not one of their family members. No one from the family of Tom and Bea Phillips ever lived in Kingfisher, Guthrie or Oklahoma City. If the pall bearer was a friend, we look at the places Simon Dalton lived. For the WW-I registration he is living in Oilton, Creek county (about 70 miles East of Kingfisher, about half-way between Guthrie and Tulsa) and his nearest relative is Adeline Dalton of Kingfisher. 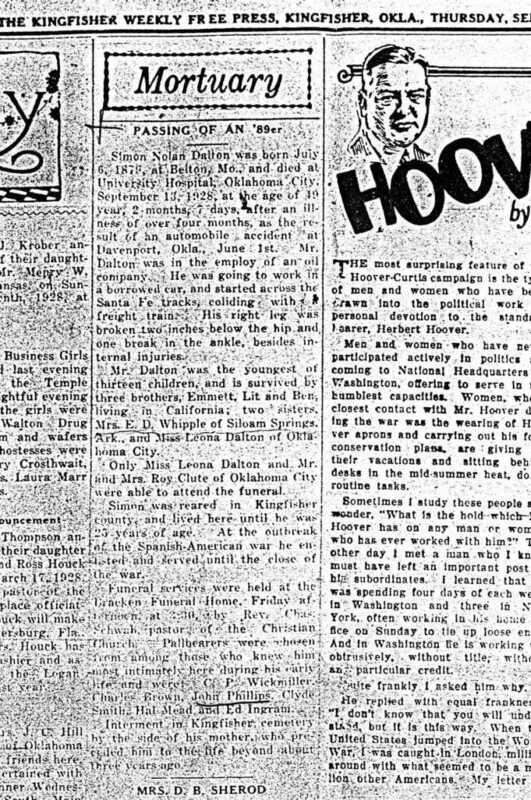 1920 he is widowed and a roomer in a boarding hotel run by Ada Taylor in Bristow, Creek county, Oklahoma (about 30 miles SSE of Oilton). His occupation is listed as "lodger". Simon Dalton died in 1928 in Oklahoma City and was buried in the Kingfisher Cemetery. The pall bearer could not be the stone cutter above for he died in 1909, but "John" and "Phillips" are very common names. For the 1930 census there were 104 people named John Phillips in the state of Oklahoma, 11 in Oklahoma City, none in Garvin cty, 2 in Kingfisher cty and 3 in Logan cty. This doesn't account for men who used an initial or their middle name. For example, John, the son of Tom and Bea, is living in Sayre, Beckham cty, OK with wife Emma using his middle name William, so the number of men who could be called John Phillips is larger than indicated by searching only for "John". There were only two people in Tom and Bea's family named John. One was their son who was 4 years younger than Simon, a possible contemporary, and the other was Tom's brother, born 1857, 21 years older than Simon (71 years old at the time). There is no record of Tom's brother after the 1880 census because he died in 1878. We are left with the "possibility" that their son John was the pall bearer (except he was going by the name "William" at the time), but not a shred of evidence he even knew the family and every evidence we do have indicates that no PHILLIPS was related to the family. There is no evidence that John Phillips, pall bearer at the funeral of Simon Dalton in Kingfisher, was related to the Phillips family of Elmore City. John Phillips, son of Tom and Bea, was living in Sayre, 80 miles away from the funeral of Simon Dalton. John Phillips was using his middle name, William, not John. John Phillips never lived in Kingfisher, Guthrie or Oklahoma City and so could not have been one of "those who knew him most intimately here during his early life". There is no evidence any of the other pall bearers were related to Simon and the statement in his obituary indicates the pall bearers were selected from his close friends, not his relatives.